I have progress to report, along with a challenge for those interested in making a significant and immediate impact on the island. The sad reality is that fewer than 10 percent of households on the island have access to a latrine. In one cluster of villages where there were over 400 homes, there was only one latrine. ONE. It’s no wonder that diarrhea (typhoid fever, cholera, worms, hepatitis, among others) kills more kids here than any other disease. The good news is that people here are getting it, and are responding en-mass to our message of how important latrines are to the health of their families and village, and to the deal we offer to them that if they dig their pit, we will provide them with the cement to build a commode base. In one village (~100 households) every home now has a latrine, and by the end of this month, another village will have 100 latrine use. Word around here is that this statistic is unheard of in Haiti. The exciting problem we have now, though, is that the message has spread much faster than we thought it ever would, and right this minute about 400 families (scattered across some 20 villages) have dug pits, hoping that we will extend the offer to them too. What’s exciting is that there is no question that this will translate immediately into fewer diarrhea-related illnesses and deaths. We already noticing decreased illnesses. The challenge I’ll throw out to all of you out there in blogland is this… can you help me buy the materials for these 400 latrines? The cost is 20 bucks per latrine. Through the end of this year (just 4 weeks!) 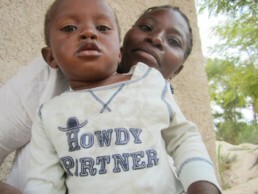 we will designate every gift coming through the paypal button on this blog to help us build latrines. $20 – one family gets a latrine. $100 – five families. $2000 will provide an ENTIRE VILLAGE with latrines. 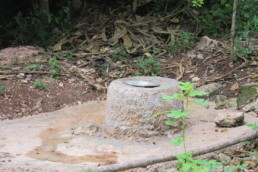 Our long term goal, of course, is to see every one of the some 10,000 homes on the island to have a latrine. This statistic alone will send shock waves across Haiti, and I think we should do it. Any partners? I get home on Monday after a week of meetings here in Haiti. I am SO encouraged, so energized to continue the work I feel called to do.